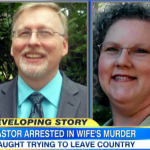 Dan appeared on Good Morning America this morning to discuss Richard Shan, a Baptist preacher from Alabama who is accused of murdering his wife. Shan was arrested while trying to leave the country but contends that he did not know he was a wanted man at that point. Says Dan, “The question is was he always trying to leave the country on January 1st because his defense is, I had long been planning to take this trip and it’d been on their Facebook page, on their website saying that he was going to be taking a trip. Even back in November it said that, the question is, was he going to be taking this trip on January 1 and then the authorities issued an arrest warrant on December 31st? Or was it the opposite which is, the authorities issued the arrest warrant and then, lo and behold, January 1, he says, I’ve got to get out of here. His claim is, he didn’t know there was an arrest warrant out for him, that’s why he was so surprised. There are a lot of questions here that have yet to be answered.” Watch the full clip here.